Among the different types of semiconductor memory recordable media, flash memory is the general name for a group of products including CompactFlash, SD memory cards (including mini and micro), USB data storage drives, which are made up of EEPROM (Electrically Erasable Programmable Read-Only Memory) – a type of non-volatile memory that can preserve information even without electricity thanks to the particular properties of the device – and a control chip for error correction and fault management. In the past the market was flooded with various devices, but today the aforementioned device has become widely accepted as the default standard. Taking advantage of the ever-increasing storage capacity and speed of flash memory, as well as the use of standard interfaces, this form of memory is now broadly used as the recording medium for digital cameras and cellular telephones. SSD (Solid State Drives) in PCs as secondary storage devices can also be grouped into this category. CompactFlash uses a parallel ATA interface that is compatible with PCMCIA 16-bit PC cards, which means that even if a PC does not come equipped with a special expansion slot, flash memory can be inserted in the PC card slot as a removable disc drive through the use of a simple adapter; it can also be used with an ATA connection as a fixed disc, or through a USB adapter as USB memory. While most other forms of media use a serial interface, ever since the Memory Stick PRO, there has been a trend to return to parallel interfaces because of increasing speed. 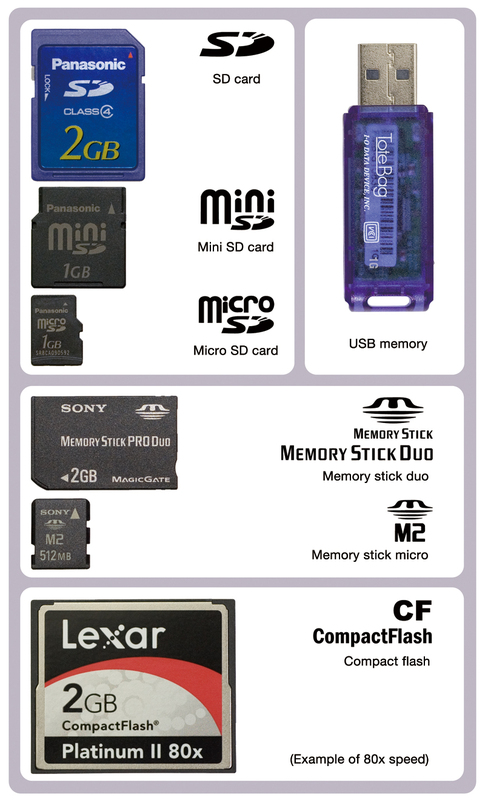 Each of these forms of flash media are able to be removed without first cutting off power to the device (“hot-swapped”), but can only be removed when they are not being accessed. Some storage media have given the speed as performing data transfers at a rate that is some multiple (e.g., 6x speed) of the speed of data transfers used in audio CD playback (150KB/sec, or 1.2Mb/sec), in much the same way that drives and optical storage are, but this sort of designation has not become the norm. Because USB memory is recognized on compatible PCs as a supplementary USB Mass Storage Class memory device that does not require an added disc drive, compatibility with both Mac and Windows environments — long a concern with floppy discs, magnetic optical (MO) discs, CD-ROMs, etc. — has been ensured; nonetheless, it remains essential to consider data compatibility, such as the presence of resource forks and limits to extension naming at the file level, and differences in line endings at the application level.